A YOUTUBE video viewed by more than a million people about a young boy who designed a cardboard arcade in his dad’s hardware story inspired Year 7 students from St Brigid’s Primary School, Nerang, to create card-board putt-putt golf courses to raise money for Catholic charities. Realising the impact one small boy made on his community by creating a cardboard arcade in the back of his father’s shop, the Year 7 students set out to make their own golf course to make a difference to lives shaken by Typhoon Haiyan in the Philippines. Students, teachers and parents from Prep to Year 6 brought along their gold coins and piggy-bank savings to buy a treat and play on handcrafted putt-putt golf courses. The courses included a haunted house, beach scene, a Japanese manga-inspired city, a castle guarded by a dragon and a candy land, complete with chocolate-milk river. 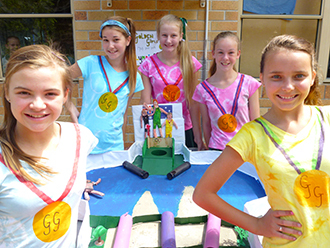 The school community raised almost $900 from the mini-golf course and food stalls. Half the money will be donated to Catholic Mission. The other half will be distributed to nine charities selected by the Year 7 students, including The National Breast Cancer Foundation, RSPCA, Montrose Access, The Starlight Foundation, Act for Kids, Animal Wel-fare League and Camp Quality. The selected charities were chosen after the Year 7 children investigated moral issues impacting our world today. Assistant principal Karen Petherick said the courses the students created “were truly remarkable”. Year 7 student and school leader Jessica Morcan said the day was “a roaring success”. “The mini putt-putt golf day was a fun and interactive way of fundraising, and I really hope the donations make a difference,” she said. Student Cody Armstrong said it was fundraising that left the school “with a smile”. This end-of-year fundraiser, run by the Year 7 classes, has become an annual event at St Brigid’s for the past 10 years.